We’re so excited to release the results of our first annual “Trends in Babysitting” survey! This survey explores how parents across the United States consume babysitting and what their attitudes are on the topic. What we learned was fascinating! The average American family spends approximately $462 a year on paid babysitters alone (this doesn’t include preschool, daycare or nannies). Despite shelling out so much each year for paid sitters, the majority of parents we spoke to were much happier with the quality of care they get from free sitters than from paid ones. 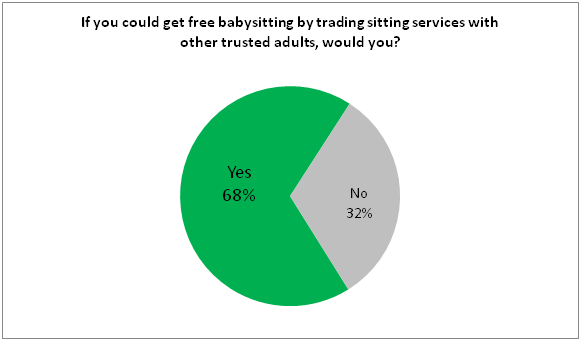 Only a quarter of parents we surveyed knew about babysitting coops; yet over two-thirds said they would like to trade babysitting with other parents. This tells me we have an education problem — coops are great and families would eagerly join them… if only they knew about them. We need to spread the word. Feel free to share the survey results with others and use them in your own blog (but please link back to us if you do!). If you do write about the survey findings, let us know! We’ll include a trackback at the bottom of this post. We’ll be conducting the survey annually, so that we can measure how babysitting habits change over time. The full Trends in Babysitting 2010 can be downloaded here. Trends in Babysitting 2010 by Sitting Around is licensed under a Creative Commons Attribution-NonCommercial-ShareAlike 3.0 Unported License. Are you a journalist, researcher, or blogger and want to answer a particular question that isn’t covered in the released data? Contact Us and we’ll see if we can cut the data in a way that answers your question.